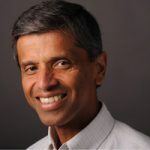 Professor Kamat’s research has made significant contributions to four areas: (1) Photoinduced catalytic processes using semiconductor and metal nanoparticles, nanostructures and nanocomposites, (2) Development of light energy harvesting assemblies (e.g., quantum dots and inorganic-organic hybrid assemblies) for next generation solar cells, (3) Utilization of carbon nanostructures (SWCNT and graphene) as conducting scaffolds to collect and transport charge carriers in solar cells and fuel cells, and (4) Environmental remediation using advanced oxidation processes and chemical sensors. He has directed DOE funded solar photochemistry research for the past 30 years. In addition to large multidisciplinary interdepartmental and research center programs, he has actively worked with industry-sponsored research. He has served on many national panels on nanotechnology and energy conversion processes. He has published more than 450 scientific papers that have been well received by the scientific community (51000+ citations) and he has an h-index of 120. Science Watch of ISI included him among the Top 100 chemists of the decade 2000-2010 and Most Cited Chemists in 2014 and 2016.